UP Primary Teacher Transfer Online Form 2018 is beginning from 16 January 2018. Many Govt Teacher who wants antar Janpadiya Tabadla they can also apply and relaxation given to Female who live in same district for male who are containing its duty up to 10 years will get their favorite districts. UP Primary Teacher Transfer 2018: Latest News Update 10 April 2018 to 16 April is the Last date to fill Error in Teacher application. is 47,000 posts is vacant and Transfer Link is available up to 25 January 2018 (Expected to extend). 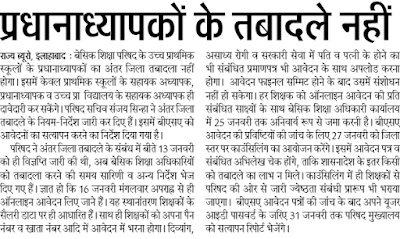 So no need to worry about late on filling transfer of up primary teacher or other LT Grade, TGT PGT Teacher. In Uttar Pradesh the largest number of employee holder primary school and more than 15 to 20,000 teacher are retiring every year. Primary Teacher Transfer 2018:- Many Teacher waiting to get Tranfer list and asking teacher to teacher about when will be the transfer letter on hand they received. 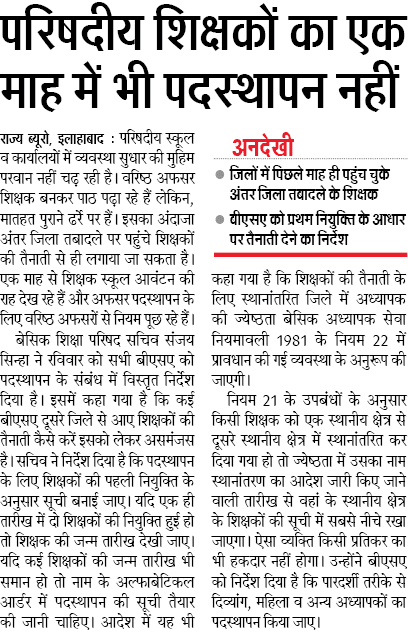 A latest news is BSA said in a order to recruit only through Pratham Niyukti. 1. Female Teahcer get transfer near but not far to her Husbands home. 2. 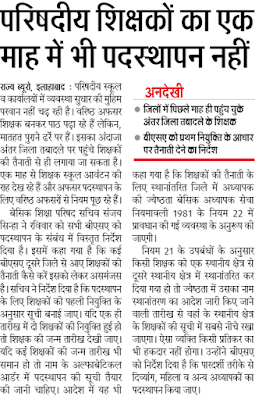 In district teacher already visited the school where they get allotment letter. UP Primary Teacher Transfer List 2018: before filling Online form It is mandatory to add pan card number while applying. 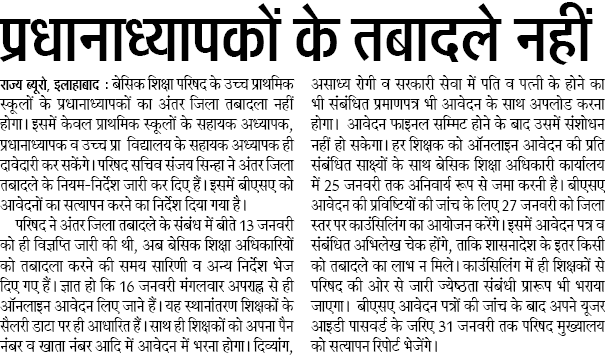 Many Teachers applied in period of May to June because of summer vacation but New Govt only wants work and in statement they also said Good work, Proper attendance of teacher provides closer to transfer. UP Teacher Antrajanpadiya Transfer 2018:- New rules from 1st June 2017 is Only those teacher will get Antrajanpadiya transfer letter who have given service up to 10 years or due to some illness. UP Principal Transfer 2018: Their is now transfer order for Principal of Junior High school. Online Application Form: 16 January 2018. Teacher transfer List Announced : May June 2018. Eligibility criteria : Minimum 3 Years Service in Primary / Junior Teacher in Uttar Pradesh. Number of Choice locks District: Only 5 District should be Chosen to Transfer Preference. Districts: Allahabad, Lucknow, Jhansi, Jalaun, Mahoba, Hamirpur, Gorakhpur, Mau, Siddhartha Nagar, Kanpur, Meerut, Muzaffarnagar, Baghpat, Kushinagar, Gajipur, Ghaziabad, Bulandshahr Banda, Dehat Kanpur.